Winning the Long War is a trenchant examination of the past seven years of the Global War on Terror, the future battlegrounds that will confront the United States in the struggle against radical Islam in the years ahead, and how America can reclaim the initiative in what has become the defining struggle of the twenty-first century. Middle East expert Ilan Berman offers new thinking on counterterrorism strategy and provides the new administration with ways to close the gaps in current American counterterrorism strategy. While there are many books about fighting terrorism, none offer Berman's approach of integrating diplomatic, legal, economic, military, and theoretical strategies into a comprehensive national security action plan. 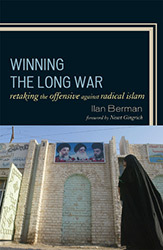 Using cutting edge analysis of current terrorism trends, Winning the Long War identifies three central failings that triggered the West's retreat and radical Islam's simultaneous advance: the failure to properly define the enemy, the inability to dominate the battlefields, and the inability to calibrate counterterrorism strategies. Demonstrating the need for more creative thinking about the nature of the conflicts in which the West now finds itself, this book lays out the steps that must be taken to win the long war.